Khabib Nurmagomedov has posted a mock-apology on Instagram for the cage-side brawl he instigated after his victory over Conor McGregor at UFC 229. The photo Nurmagomedov posted depicts him with a laughing smile and the caption: "My face when someone says that I didn't like my jump, but I tried so hard. I hope I didn't hurt anyone's feelings with this leap." The remorseless move, however, is unlikely to endear himself to the Nevada State Athletic Commission who have held back Nurmagomedov's $2 million fight purse after he scaled the cage to launch a flying kick at Conor McGregor's stablemate Dillon Danis. 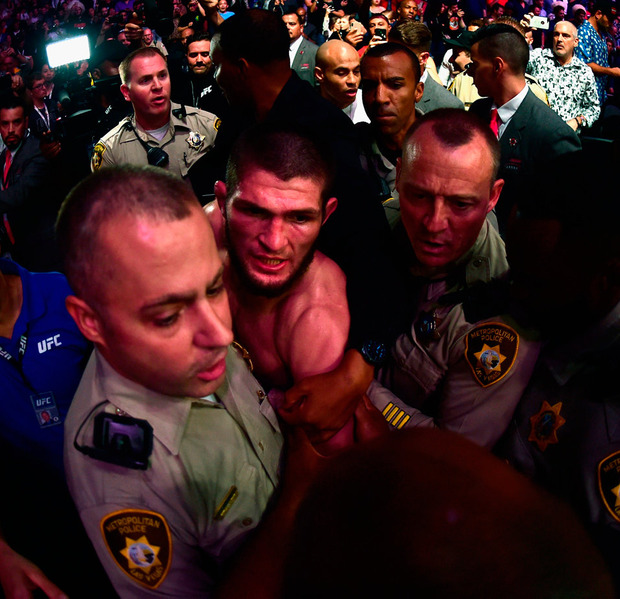 Nurmagomedov is set to meet with the commission to discuss the incident where any reprimands will be finalised. The commission will also decide whether the Russian fighter will be stripped of the UFC Lightweight crown which he claimed after forcing McGregor to submit to a rear naked choke in the fourth round of their one-sided contest. Nurgamedov did offer a sincere apology for jumping into the crowd at the post-fight press conference in the early hours of Sunday morning but then added the caveat that he didn't understand how people could criticise him while not condemning McGregor's consistently offensive remarks in the build-up to their long-awaited clash. "This is not my best side," he said on Saturday. "He talked about my religion, my country, my father. He came to Brooklyn, he broke bus and nearly killed two people. So why do people still talk about me jumping over the cage? I have shown respect.